At FIT, our trainers take their education seriously. We pride ourselves on seeking out the best information available to continually serve our clients better. On occasion, our trainers take time to attend education. Today’s post is brought to you by Jeff P. who recently attended a seminar by well-respected strength coach Charles Poliquin. Last month, I spent 7 days at the Poliquin Performance Center in East Greenwich, RI to take the Biosignature Modulation course, as well as attend the 3rd Annual Eleiko Strength Summit. Developed and taught by Coach Charles Poliquin, Biosignature Modulation (or, biosig for short) is an individualized method of body fat loss. Basically, specific receptor sites on the body are blocked and lead to dysfunction- that is, there is a relationship between where you store body fat and your hormones. Technically speaking, there actually is such a thing as ‘spot-reduction’ in fat loss. For example, that stubborn tummy-fat is an indicator of prolonged exposure to the hormone cortisol (a.k.a. low grade adrenaline). Cortisol stimulates abdominal fat synthesis by inhibiting growth hormone. The good news is that this can be reversed through recommended dietary and supplement intervention. During class we discussed the relationships of 6 key hormones and 12 sites on the body as well as the methods for modulating these sites. For example, increasing magnesium intake has shown to improve insulin sensitivity, improve quality of sleep, and improve cortisol management (anti-stress). We also practiced measuring the sites 3 times a day for 30 minutes each. Coach Poliquin’s teaching method is geared for 70% retention: 40 minutes lecture, 10-point review, 5-15 minute break, repeat with or without 20-30 minute practice. With over 100 pages of notes, I’ll testify that it is quite effective and consequently very helpful! 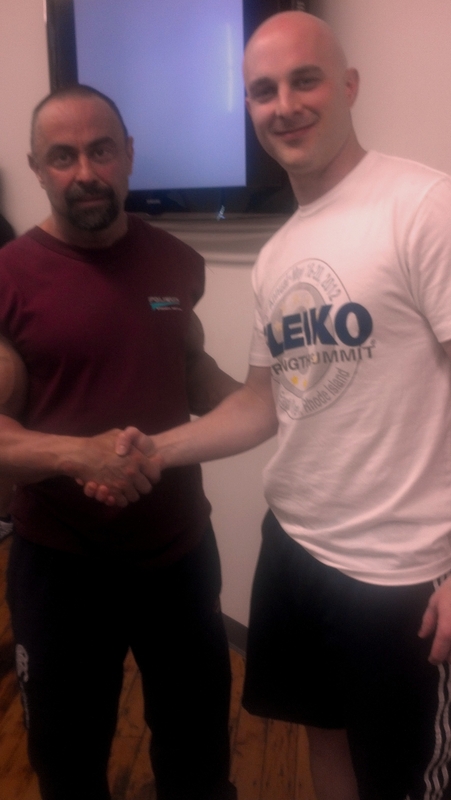 Stay tuned for Part 2 of Jeff’s experience where he shares his insights from the Eleiko Strength Summit. This entry was posted in Body Composition, Nutrition.